Campagnolo is widely considered to be one of the most respected cycling manufacturers in the world. They have consistently created bicycle components that have received praise from critics and consumers and the Campagnolo Khamsin continues this trend. The company is based out of Italy and has been making cycling parts for nearly 80 years. The Khamsin wheel was designed by Campagnolo to raise the bar in its medium profile division, something which it had struggled to do previously. The company touts the wheel’s improved performance, handling, longevity and reliability and some critics have gone as far to say that they believe this is possibly the best medium profile wheel out there on the market. Despite the price being extremely low, the wheels are high in quality. The Campagnolo Khamsin wheelse t was designed to have a high level of performance, a reduced weight, and an improved technology all at a low price. The wheels weigh roughly 1873g however they are lighter than previous models. The wheels feature stainless steel spokes with 20 straight head spokes in the front. The rear features Campagnolo’s highly praised G3 technology with 9 straight-head spokes on the left side and 18 curved-head spokes on the cassette side. 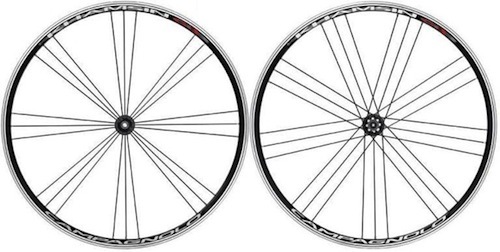 The spokes are highly balanced which provides stability even at high speeds. This is important for cyclists who train or compete at faster speeds and need to remain stable at all times. The wheels maintain maximum spoke tension and a long-lasting high performance level. The rims are lightened due to the company’s latest production process. It boasts a wear indicator system which allows cyclists to check the wear and tear of the rims at any moment. This is great for competitors who might need to make repairs on the fly. The hubs are black anodised aluminium with a high degree of lateral stiffness. There’s a reinforced spoke housing and an oversize flange on the rear wheel’s cassette side. This increases stiffness and improves the reaction time during any changes of pace. There’s no other wheel that can match the Campagnolo Khamsin in terms of performance and high quality construction at such a low price. The wheel is tough and has proven to be able to handle any course that it’s designed for. The price allows cyclists to enjoy the high quality of Campagnolo without breaking the bank, which the company prides itself on. Critics tout the amazing price to performance ratio for this entry level medium profile tyre. The G3 technology boosts this entry level tyre to a superior level in performance as cyclists can rely on the tire’s composition to improve their training or competition. Additionally, cyclists are able to monitor the wear and tear on the rims instantly, which makes for a more productive ride, training session or competition. The wheels are visually pleasing as well. The graphics have been improved and the wheels come in black and red.